Rained heavily. And persistently. And was windy. From Minute One onwards. Minute One, definition: the very start of the work day. In this case, the moment immediately after you’ve summoned up enough moral fibre to actually open the car door and step out of the vehicle to face the maelstrom. The mission today was to get to Creag Pitridh, which in normal circumstances is a delightful hill and Munro immediately south of Loch Laggan opposite the Creag Meagaidh NNR. The weather ensured that the mission became more of an ambition than a destination. Made it to 720m. Moral fibre fully spent. Underpants fully soaked (from the outside in, I might add). A challenging day for photography but the camera did come out briefly twice but only when retreating (in full disarray) from the hill. (Above) A somewhat smeary photo of Sron a Ghoire for the other side of Loch Laggan. Yes, it’s the one in the mist up there. I could have swum back to Aberarder from here. Full clothed. Quite possibly a drier alternative than legging it several kilometres back to the car at Moy? (Above) The road to perdition. 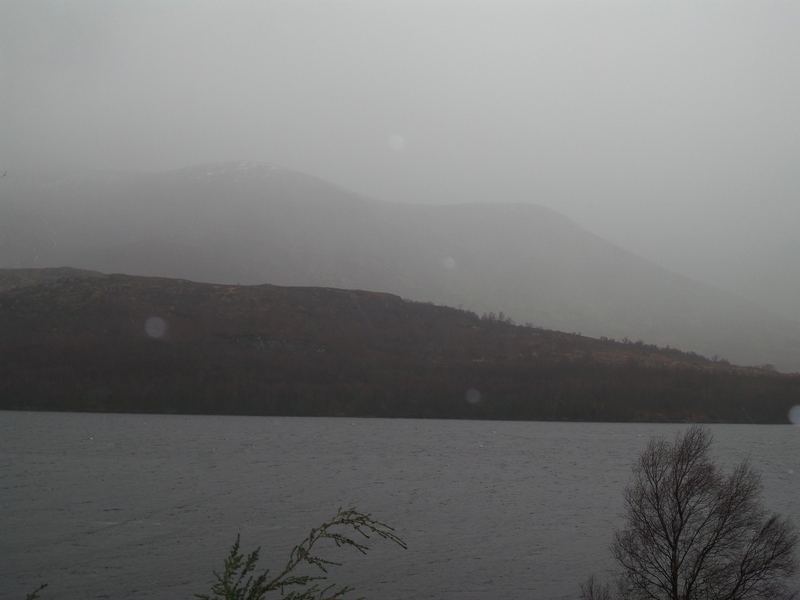 Looking west into the mist, wind and rain from alongside Loch Laggan. There’s snow in the forecast for tomorrow. 15cms. Most of it falling during the day. We’ll see. Can’t remember the last time I had some proper snow to look at. Time to get my winter head on again! As they say in Bristol ; “you made I laugh”. The hill will be white from tomorrow until May. There will be too much snow for winter sports and the Loch Eil lot will be practising ice axe arrests on the roof of their building. Wintry weather: Hang on, could be a case of premature evaluation, Stan! Stan said on 7th January: “By Feb 7th even snow shoes won’t get you out of the car park! How does one fry anything except in a pan? I have my old Yeti gaiters, red and yellow, and good for being located if upside down in avalanche debris. My good wife is presently stewing them gently with garlic and onions in the unlikely case I should have to eat them. Frying is Scotland’s famous contribution to the art of cuisine, Stan. Pan frying is the poor relation of deep frying up here. Deep fried Mars bars, pizzas and macaroni pies – all lightly battered – pioneered and perfected in Scotland. Heart stopping! Coming to a chip shop near you soon. As the kids say mega (Meagaidh) props for dragging yourself out. 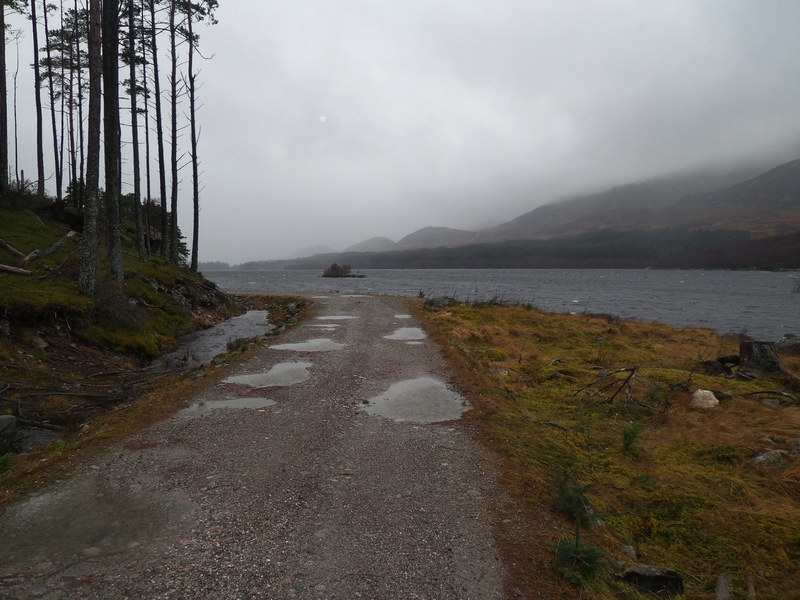 I was trail building at Laggan on Wednesday which was pretty rough and wet, but the big sleety west coast snow flakes kept moral high..
Good effort yourself! Trail building in the rain. Was a horrible day but noticeably less mingin’ east of Laggan on the journey home.